Is Ghee Vegan? – Is It Vegan? Ghee is a traditional Indian ingredient used in many dishes. It’s a dairy derivative and is essentially liquid butter. Not vegan. When ordering Indian food, please make the servers aware that you do not eat ghee as it could be added to rotis (breads) or main dishes. Hello. Is this also true of vegetable ghee? Or just butter ghee? “vegetable ghee” is just hydrogenated oil. Likely vegan, likely TERRIBLE for you. Properly made ghee IS vegan—it goes thru a complete transformation when cooked CORRECTLY & loses all link to its dairy origins..this is why ghee candles burn in the greatest temples in India. Properly made ghee has lost all link with ‘liquid butter, or ‘clarified butter’; biochemically it is absolutely different. I had the privilege of studying ~30 yrs with a Master of Ayurvedic Medicine. Thanks for considering an alternative answer which will stir comment! Vegan products are ones that do not come from animal sources. End of story. Does ghee originate from cows? Yes. Therefore ghee is not and can never be vegan. Absolutely correct, the fact that it’s origin is from animal, it cannot possibly be vegan. It still came from a cow… you could process it a thousand ways but it still comes from a cow… so no you cannot consider it vegan. Thank you for correcting the author. Properly made, ghee is dairy free! It would be correct to say that ghee is not dairy, but it is also definitely NOT vegan. This might ignite a firestorm–lets see. There is much misinformation here in the West about ghee: what it is, its health effects, what variety of ghee is permitted as ‘vegan’, and even how to properly prepare ghee. The truth is this: ‘ghee’ when properly made from cow’s milk IS both Vegan and the highest vegetarian food, if you research history of Hinduism and Ayurvedic Medicine. Although a Westerner, I had the great privilege of studying with Dr Harbhajan Singh Khalsa (Yogi Bhajan) for >30 years. He was acknowledged as a Master of Ayurvedic and Tibetan Medicine. I think this man have a point. Because, let’s say this. Lemons. Lemons are acidic tasting, yet even though it’s a fruit that’s acidic, it becomes Ph neutral when it hits the stomach. Even though it didn’t really transform, it’s properties did change. So let’s say this. If you’re going vegan to end animal cruelty or just not eat any animal derivative that’s harmful for you. Ok, that’s perfectly fine. However, if something that is a derivative from an animal byproduct were to change enough to where it removed everything bad from it, what’s wrong with it being an exception to the vegan diet? If it’s legitimately good for you, what’s wrong? Well. That’s up to the person consuming such product. Also, to be clear. Ghee doesn’t have ANY, and I mean ANY ( If done right. ) lactose or casein. So people with lactose and casein sensitivities can eat this. If the product has come from an animal, such as a cow, it is not vegan. 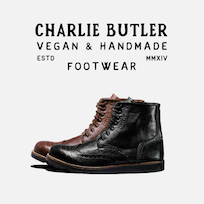 If you are wearing leather shoes, they are not vegan. If you are sucking on white mints made with beef gelatine, they are not vegan. If you are eating muesli that contains in its ingredients dehydrated milk powder, it is not vegan. If you sit down to eat a curry, and it contains ghee, a substance strained so far from its original source, begged from a holy cow fanned by the cooling fronds of a palm tree, sent to Mars for processing and blessed by god himself, served by angels and seasoned with the sap from the tree of life -it is not vegan. Ghee is not vegan as it is derived from an animal. Before taking the time to write a post tagged with your ‘credentials’, take the time first to look up the word ‘vegan’ in the dictionary. So true… and I love your post btw. LOL, great stuff! not convincing. Ghee is Vegan! Hi, I’ve come to this conversation (yes, quite late) but specifically to understand why some do, while others do not consider Ghee as a vegan product. Though I do not adhere to a vegan lifestyle, I have friends who are. As a hobbyist baker and a good friend, I want to respect the choices made by others in their diets and not offer products that would conflict. (Yes, I know that there are many options for a vegan, non ghee, fats for baking). Simply put, I am a curious person that strives to understand many of the ‘whys’ in life. I am in the search to understand and I have read points on both sides of this ghee debate and what defines a vegan lifestyle. I never even thought about honey as a non vegan food (admittedly, a light bulb moment), as under the definition of ‘no animal product ever’ I understand how that falls under a non vegan food. Now I have been left with even more questions. To quote you Sweifan, “not vegan as it is derived from an animal” leaves me to inquire how directly the animal must be connected with the food source. I do understand that there are several philosophies as to why one would choose a vegan lifestyle, one being for health, and another being the treatment of animals. I have had the pleasure of knowing a strict fruitarian, so that not even a plant is harmed. So here are some of my questions, for those who are not vegans for health concerns, but for ‘ethical’ reasons. How far must the animal be removed from the food? Meaning, if I am plowing the field with a mule, horses, oxen, etc. (as with cultures that do not have farming machinery or when an animal is used in the grinding of grain), would that fall under the ‘exploitation or cruelty to animals’ vegans are trying to avoid? Now honey, being a direct link to bees is not vegan (seen as cruel, as it removes their food source therefor ‘stressing’ the hive as a whole to produce more), but if we were to lose all our bees, who are responsible for the pollination of the bulk of plants (list included: https://honeylove.org/list-of-food/ ) does the foods on that list get excluded from the vegan (for ethical reasons) diet to ensure that the bees are not ‘exploited’? Assuming these are man maintained bees pollinating the local farm. Finally, since Maple Syrup is the intentional draining of sap from a maple tree which is then processed (boiled down) to get that beautiful syrup, is that not similar to honey, as the tree is reliant on the food it produces to survive the winter which when drained ‘stresses the tree’ just as are the bees? I’m curious to understand where the line is drawn, and why is it drawn there (yes, depending on the individual, that will change)? Thank you. I always wondered how people could say Ghee was vegan. Now I understand why some people might believe it is vegan. Thank you, Thank you. The problem with ghee is that it is sattvic and useful only if from a “happy cow” who is let free to roam, who is not pregnant, who has fed her calf to its fill and there is milk leftover which she is happy to share. Even that milk is not *vegan* though it may remain sattvic till the end of that day – it must be warm or it must be converted into other products that very day. Even such an “allowed” form of milk is not *vegan* because it is animal-origin. Vegan and pure/”sattvic” are independent terms. Ghee is not vegan, by definition, as it is an animal product derivative. Sattvic / pure may be useful in Ayurveda, but Vegan is not an ayurvedic term, it is a western one with a clear definition – non-animal origin. Please chime in on my questions, as asked under Sweifan, above. yessss great answer. the above seem to only consider vegan as linked to what we eat. a leather shoe, which isn’t going to be eaten, is not vegan because it still came from an animal. same with ghee. doesn’t matter what u do to it its not vegan. but yes, Sattvic. thank you! I have to agree with you! In a land of plenty of resources, food and choices, we are fortunate. I get upset when I hear people advocating for a world of only vegan choices. there are still plenty of areas worldwide that rely on their livestock (as in dairy producing animal… cow, goat, sheep, etc) for sheer survival. In a world where we are so far removed form the production of our food, so many forget that when you rely on your animal for so much more than milk for longer shelf life food products (as are some cheeses), dung for fuel, fertilizer, and structural, and possibly to help till soil and grind grain. These are people who are least likely to abuse their animals, as living without them would surely plunge them into greater poverty. I have seen firsthand how important these animals are in a families life, and how devastating their death can be. yeah….first you have to know…..u too came from animal body….so why do u need vegan food when u yourself came from flesh and blood….please transformation comes from inside….since we have animal instinct we need to transform our self to higher being or higher consciousness…that is why we have meditation…yoga these are tools to explore within ur self who are you?….than you will know that you are just an animal like others….knowing that resentment comes and so do ego…therefore ego is just an illusion u make inside your mind to show others that you r not an animal and so. but the real transformation comes when you will see that you are an animal and you accept that instead of resenting it…so what will happen..u will have an urge to surrender your animal instinct and as your meditation improves so is your ability to surrender. this is real transformation……it doesn’t matter whether u r vegan or whatever outside….the change has to come from inside….so ghee is an example of that transformation….yeah it has came from a cow…..but it has transformed into the higher state…i would say that ghee won’t carry any emotions neither ego or any animal instinct. it has transformed from animal to absolute purity…. an interesting exchange if ideas. My child wants to be a vegan because she believes eating animals and animal derived products is adding to climate change and global warming. I am looking for butter alternatives. So ghee does not count…unless it is sources from a free range cow that is is not on a diary farm? It still adds methane to the planet …but I doubt vegans are advocating the death of all cows or animals. Can I convince my daugther that properly sourced ghee is not going to add to gobal warming? coconut oil is your best butter alternative for her. Coconut oil according with studies shown by Dr Gregger is not very healthy, olive oil butter is delicious and healthier than Coconut oil. As I read comments made here it is clear that most of you have book knowledge only you just do not understand what ghee is and I can not ‘blame’ any of you because to understand what ghee is you have to study its property under a teacher that has knowledge authority which is obvious that most of you do not have, Do not take offense with these words however know that ghee is a miracle in and of itself if regenerates bodily functions that nothing else can. So before one speaks, it is important to study the content of the statements made – before – they are written and so it goes for anything in life. This of you vegans, I salute you for it is an excellent diet, some of you will say that its ‘the only diet’ there is, well in your perfect world it may be however this world is not perfect and so is one’s opinion about ghee if its not backed by knowledge, so I invite all of you who are under the impression that ghee is not vegan and do that for your own self and study the actual properties of what ghee is and you will come to the irrefutable conclusion that ghee is an oil, yes it’s from a cow but its an oil and a great oil it is. Open yourselves to step outside book definitions and might just find a whole new world out there, one that is healthy for you. I think you are confusing healthy with Vegan, Ghee can be pure, healthy, from a happy cow and without any karma attached, but it will never be vegan by definition.